Touch of Peppermint Oil and Tea Tree Oil. 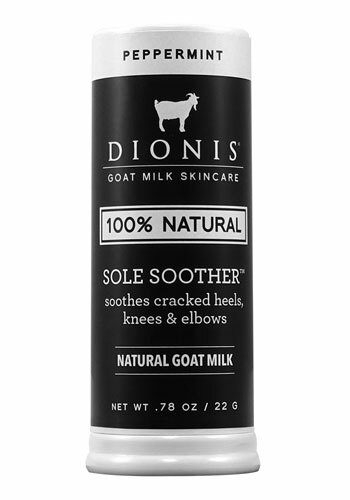 100% natural Sole Soother will soothe and moisturize dry, cracked heels, elbows, dry hands and knees. Peppermint scented stick leaves no greasy residue. Just slip on your shoes and clothes and go! Formulated with a blend of Goat Milk with Shea Butter for a deep moisturizing treatment and Tea Tree Oil and a touch of Peppermint Oil to refresh while it soothes. Goat milk is naturally enriched with high amounts of protein, fat, iron, vitamin A, B6, B12, C, D, E, and many more. These vitamins and minerals help the skin rebuild, and help retain skin moisture. Directions: Rub stick along cracked heels, rough elbows, dry hands and knees to soften, smooth and moisturize.